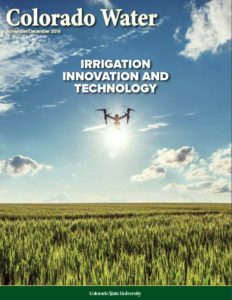 View the new Colorado Water newsletter highlighting the Irrigation Innovation Consortium & current projects underway by IIC members! The Irrigation Innovation Consortium (IIC) is a joint initiative between private, public, and university organizations, addressing growing water scarcity in the western U.S. and worldwide. The Consortium will be an internationally recognized center of excellence in irrigation automation, supervisory control and data acquisition (SCADA), data management and decision support, modernization, and management to enhance energy and water use efficiency in irrigated food systems and amenity landscapes across the globe. This partnership strategically capitalizes on existing strengths to develop powerful synergies between the universities, USDA-ARS, the Irrigation Association, the Irrigation Foundation, the Foundation for Food and Agricultural Research (FFAR), and numerous irrigation equipment manufacturers with opportunities for joint collaborations in demonstrations, technology transfer, tailored workshops, certifications, and student training. The IIC is currently recruiting industry organizations to join the consortium. For information on joining, please contact Stephen Smith, industry relations for the Irrigation Innovation Consortium and FFAR advisory council member.